All eight suspects in the killing of a student during a recent pub brawl have been arrested and appeared in court yesterday. 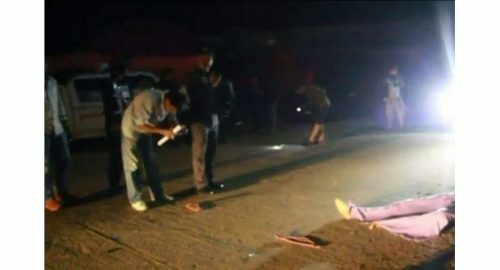 The victim suffered a fatal wound to his head during the fight at a pub in Chaiyaphum province, after apparently being hit by a stone. “I started the fight because he danced in a way that blocked the entrance to the restroom,” one suspect, 20-year-old Kittisak Bamrung, is said to have told police. He said he later regretted what he had done after discovering that the victim was a fellow student at the same educational institute. Pol Captain Assawin Promnok, of the Muang Chaiyaphum Police, said officers already had strong enough evidence to identify who had used the stone. “The attacker should have confessed – otherwise he might not be treated leniently by the court,” Assawin said. To date, all eight suspects have admitted being involved in the brawl but none has confessed to being the person who struck the victim with a stone. Chaiyaphum Provincial Court yesterday granted bail to three of the eight defendants. Of the five remanded in custody, two are being held in an adult prison and three in juvenile detention.